Candace Nelson knows a good cupcake when sees (and tastes) it. She spends a great deal of time around the tasty confections, whether baking and decorating them, talking about them or judging them on television. Nelson, 36, is the owner/operator of Sprinkles Cupcakes, the world's foremost cupcake bakery. She is also a judge on the popular Food Network show, Cupcake Wars. A former investment banker, Candace Nelson, 36, always wanted to be a baker. As a young child, she would help her mother cook up specialties at home. As an adult, she decided to take this passion to the next level. She attended Tante Marie's Professional Pastry Program in San Francisco, California, and upon graduating, started up a small cake business out of her home. After time, she realized that "the opportunity in perfecting a dessert could be seen as a daily indulgence." Thus Sprinkles Cupcakes was born. In 2005, she opened her first cupcake bakery in Beverly Hills, California, where she currently lives with her husband and Sprinkles co-founder, Charles Nelson, and 3-year-old son (and another on the way). She recently filmed an upcoming season of Cupcake Wars and has appeared other Food Network shows such as Throwdown with Bobby Flay and The Best Thing I Ever Ate. Nelson recently took some time out of her busy schedule to chat with LoveToKnow about her life as a cupcake baker and television personality. 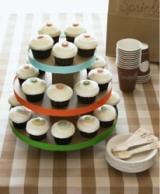 LoveToKnow: What makes your cupcakes stand out from all the others? Candace Nelson: We bake fresh from scratch daily using only the best ingredients. The cupcake you receive at our store came out of the oven only a couple hours before. We also hand frost each of our cupcakes with a spatula. It takes more time than piping, but it's a handcrafted difference you can see! LTK: What type of ingredients do you use? Which ones, including those for decorating, do you stay away from? CN: We use the finest, all natural ingredients, including sweet cream butter, bittersweet Belgian chocolate, pure Madagascar Bourbon vanilla, fresh bananas and carrots, real strawberries and natural citrus zests. We never use any ingredients containing trans-fats or hydrogenated oils. Even our sprinkles are of the finest quality - made of real chocolate from France rather than the waxy fake stuff you find in the supermarket. LTK: Why did you open your first cupcake bakery in Beverly Hills? How many locations do you have now and do you have any scheduled to be opened soon? CN: We found the perfect location for our first bakery in the heart of Beverly Hills (California). The city has an ideal mix of industry (primarily entertainment), family life and Los Angeles events. We currently have seven locations (Beverly Hills, Newport Beach, Dallas, Scottsdale, Palo Alto, Chicago, and Houston) and will be opening three more (San Diego, Washington, DC, and New York) in the next six months! LTK: How many different types of cupcakes do you offer? CN: We have a rotating flavor schedule in which we offer different flavors each day. We offer our most popular flavors daily and have seasonal specials throughout the year! At Sprinkles, you can celebrate St. Patrick's Day with Irish chocolate, chill in August with key lime and ring in the holidays with our JOY box! LTK: What is the most unique order of cupcakes (meaning design) you have received? CN: We began offering custom decorations about a year ago in which customers could customize the sugar decoration that tops their cupcakes. We've seen it all, from corporate logos to wedding monograms to secret symbols! LTK: Tell me about your association with Cupcake Wars. How did you get involved with that? CN: I was approached by the creators of Cupcake Wars to serve as one of two permanent judges on the series. The show pits cupcakes bakers against each other in a series of elimination rounds leaving one baker standing as the episode's winner. We just finished filming our second season and I'm very excited for it to air this December (2010)! LTK: How do you feel about lending your expertise on a show such as this? CN: It really is great to see how cupcakes have taken on a life of their own! When I opened Sprinkles, we were the world's first cupcake bakery. Now that there are hundreds nationwide; it is an honor to be considered an authority on cupcakes. I always am surprised by the cupcakes the contestants are able to create under the pressure of time and crazy ingredients! LTK: Do you have any advice for cupcake bakers hoping to get on this show someday? CN: Be original! Our most successful contestants are unique in their approach and passionate about their product! LTK: Is there anything else you'd like to add? CN: Be the first to know the Sprinkles scoop when you check out our social media pages on Facebook and Twitter! We give away free cupcakes every day at all our stores via social media and announce store and flavor updates!